Building the American Dream: Durham Homes of the WWII Era –––––––––––––––––––––––––––––––––––––––––– The Bull City's pre- and postwar housing boom is at centerstage in this year's Preservation Durham home tour, Saturday, April 27th and Sunday, April 28th. Click the banner image below for tickets and read up on the history of the fantastic houses featured in this online companion guide. Bring your friends and family along, and stay tuned for more on accompanying events! Welcome to the 2019 Preservation Durham Home Tour! Whether you're reading up in advance, plotting your route, or navigating the stops on the tour days, this is your digital starting point. Be sure to buy tickets for everybody in your group (available here), get a few extra and invite some neighbors along! Word to the wise, they're cheaper in advance - $20 vs. $25 day of! This year's theme, Building the American Dream: Durham Homes of the World War Two Era, takes us back to an earlier but somehow familiar phase in our city's complex history. Development was booming, but how it played out raised questions about who it was for. The unprecedented increase in housing stock during those years has left an unmistakable mark on Durham's streetscape, along with lessons for the next chapter in the Bull City story. Now that you've got your bearings, take a few minutes to read through the tour introduction below (copied from the official booklet with a few added links and images). If you've already got a sense of the context, you can skip down to the pages for the individual houses. Owning a home has long been considered a cornerstone of the American Dream, the surest means of building wealth and passing it along to one’s children, but the U.S. wasn’t always a nation of homeowners. In the first part of the 20th century, residential mortgages were unregulated, available only to those who could afford a fifty percent down payment and a five year payback period on a high, variable rate loan. Fewer than half of American homes in 1934 were owner occupied. The Great Crash that began in October 1929 reduced worldwide GDP by fifteen percent, triggered a daisy chain of mortgage loan defaults and bank foreclosures, and by 1933 caused the failure of one-third of our nation’s financial institutions. The US home ownership rate dropped to around forty percent. In order to stabilize the banking industry, Congress and the Roosevelt Administration enacted the National Housing Act of 1934. This key New Deal legislation created the Federal Housing Administration (FHA) and Federal Savings and Loan Corporation, and tasked them with designing and overseeing a nationwide mortgage insurance program. The Home Owner’s Loan Corporation (HOLC) was also established to help struggling homeowners refinance to longer- term fixed-rate mortgages. Although much of the American South had been crippled by a severe downturn in agriculture and textiles since the early 1920’s, Durham was an exception. Insulated by the growth of the tobacco industry and the construction of Duke University’s West Campus, Durham’s population soared 277 percent between 1920 and 1940. The pent-up demand of 60,000 residents crammed into some 14,000 housing units met with the sudden availability of 30-year mortgages backed by the United States government. Although the diversion of materials to the war effort continued to hamper construction, the number of building permits issued in Durham rose from 236 in 1932 to 1,689 in 1953. With new home construction essentially at a standstill during the Depression, advances in residential design stopped as well. One of the few things happening that captured national attention was the ongoing restoration of Colonial Williamsburg funded largely by John D. Rockefeller, Jr. Exploration of “Early American” styles appealed to an isolationist nation reluctant to get involved in the affairs of a world in turmoil. When home construction began again just before and again after World War II, many architects and homebuyers turned to Williamsburg for inspiration. The resulting homes were comfortable colonials. Many had just simple colonial references, but others were near reproductions of 18th century tidewater Virginia originals. In Durham, architects like George Watts Carr and Archie Royal Davis design elegant examples of the Williamsburg style for their clients. The impacts of federal lending policies in place during this period of remarkable growth are still evident throughout Durham. The FHA not only placed controls on mortgage rates and terms, but also established highly specific criteria for loan eligibility in order to mitigate risk. The FHA advised lenders to invest only in traditional home styles in already stable areas. These policies reduced the likelihood of default but increased the disparity between healthy and declining neighborhoods. Among the better known FHA Technical bulletins, Principles of Planning Small Houses encouraged the economy found in simple floorplans and standardized building materials. Efficiencies could be found by using the kitchen or living room for dining space, for example, or by placing windows at building corners to increase cross ventilation without giving up wall space. First floor utility rooms were affordable and convenient, while basements were costly and required floor area for steps. Guidelines for economical construction in the 1940 FHA manual Principles of Planning Small Houses. 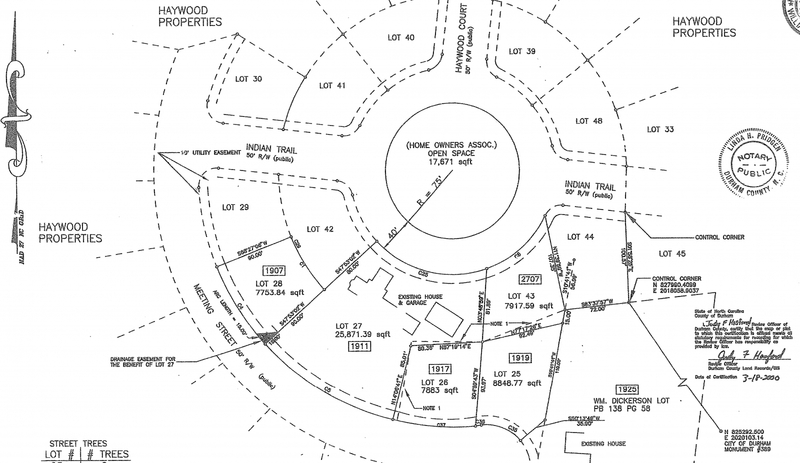 Two new housing forms emerged. Minimal Traditional Homes were usually small and single-story, with simple low–sloped roofs and little exterior ornamentation. They could be built quickly and affordably, and became the defining style of countless postwar subdivisions. Ranch Homes were often broader, with picture windows, deeper roof overhangs, and a more open floorplan. Often advertised as “traditional outside and modern inside,” the “casual family- oriented style” of the ranch was embraced by magazines of the period such as House Beautiful and House and Garden. 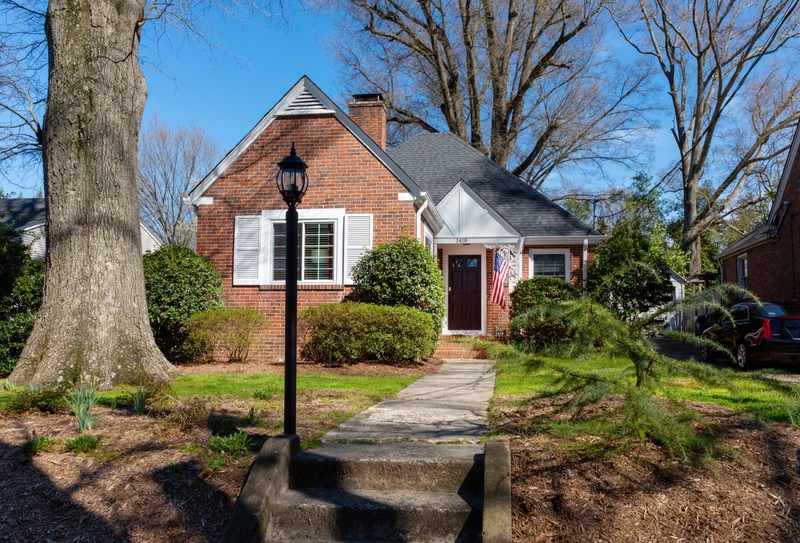 Colonial, Minimal Traditional, and Ranch homes began to infill undeveloped lots among the bungalows, and tudor homes of Durham’s older middle class neighborhoods, and to define entire blocks on their outer edges. Older examples predominate in a radial belt 2 to 2.5 miles from Five Points – the northern edges of Watts Hospital, Trinity Park, and Duke Park, the Rockwood area southwest of downtown, and the College Heights neighborhood south of NC Central. Photo labeled "Modern Cottages, Northwest Durham." 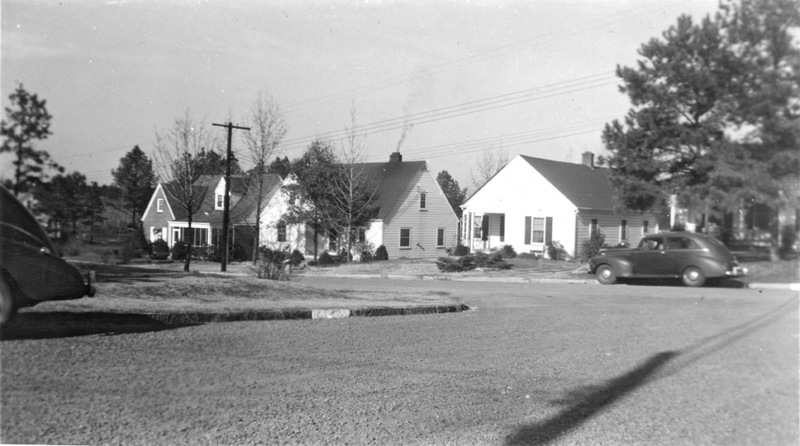 Looking northwest from Carolina Avenue across Sprunt Avenue in the Watts-Hillandale neighborhood, 1945 (Durham County Library, North Carolina Collection). The profound effect of Residential Security Maps is also still felt in Durham. Developed by the HOLC, Security Maps were meant to indicate the level of risk of real estate investments in more than 200 surveyed cities. Based on input from local brokers and appraisers, neighborhoods were assigned letter grades, with FHA guaranteed loans made almost exclusively in the A and B zones. C zones were considered to be in decline and D zones high risk, due in large part to their racial composition, and “obsolete” housing stock. These areas were outlined in orange and red on the HOLC maps, or “Redlined.” It was nearly impossible to get a residential mortgage in a C or D Zone. In Durham, the D neighborhoods were often the lowest lying areas topographically, the poorest, and almost exclusively African American. Wall Town north of Duke’s East Campus, the areas surrounding Maplewood Cemetery, Hicks Town (since eradicated by the Durham Freeway) and the Hillside Park and Grant Park neighborhoods north of NC Central were all D zones, as were the Morning Glory mill village east of Golden Belt and the East End to its north. Investment in these areas between 1934 and 1968 was almost nonexistent due to the scarcity of capital. Although the use of Security Maps became illegal with the Civil Rights Act of 1968, many of the redlined areas in Durham and across the nation continue to display significantly lower property values, lower rates of home ownership, lower credit scores, and higher rates of economic and racial segregation that their neighbors. 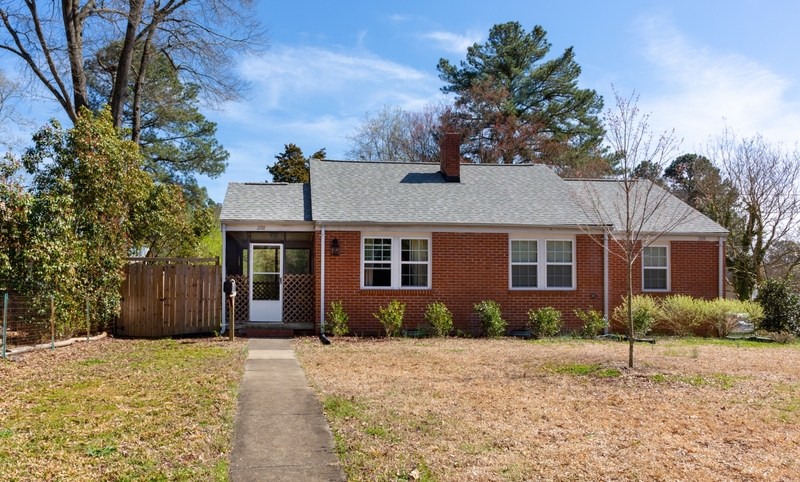 Federal policies conceived to stimulate the economy and stabilize the banking industry helped many Durhamites realize their American Dream of homeownership. They also ensured that it remained beyond the grasp of others. And now, without further ado, the homes themselves! The house was built in 1948 for Willard C. and Maude Ford. Willard Ford operated the Ford Metal Molding Company, a successful metal fabrication business with offices in Manhattan and a plant in New Jersey. The Fords lived in Teaneck, New Jersey, a commuter suburb north of New York. Ford’s company made stainless steel sinks and other metalwork for homes and a host of other applications. In 1948, the firm leased land near Louisburg, North Carolina, and began to build a new factory. In June of that same year, the Fords purchased the lot at 2112 West Club and began construction on their new, North Carolina, home. At the time, the government was only beginning to loosen controls on building materials after the war. Small homes were still favored by government housing programs and lenders. That suited the Fords. They did not need a large house. Their only child, Reed, was in college. 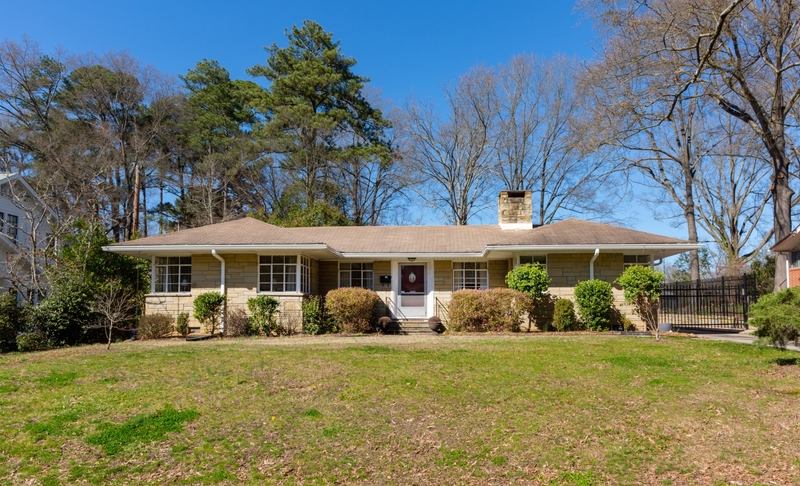 The house the Fords built at 2112 West Club is one of Durham’s earliest Ranch Style houses. It differs from later ranches in a number of ways. Its street face is organized symmetrically. Later, larger ranches are famous for their rambling form, but this small house presents a perfectly balanced facade to the street. This balance gives the design a compelling clarity not always present in other houses. That clarity is enhanced by the house’s uniform limestone cladding. Stone accents on Ranch Style houses are not unusual, but stone is expensive and people who can work with it are hard to find. An all-stone Ranch is very unusual. The Fords lived in their Durham home only one year. A legal dispute over the lease on the new factory site in Louisburg was resolved against the company. The Fords sold their house in 1949 and returned to New Jersey. The sales price was ,750 – at the time an impressive sum for so small a house. In 1954, the house was purchased by Max and Sarah Swartz. 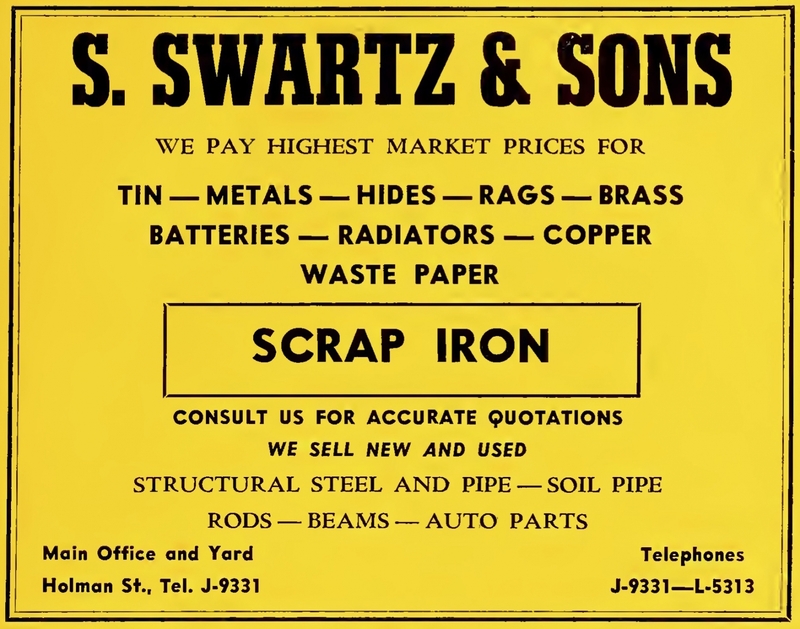 Max Swartz and his brother Henry were partners in Swartz & Sons, the scrap and junk business their father Sam Swartz started in Durham in 1904. The house at 2112 Club was their home for nearly forty years. Sarah died in 1991 and Max died in 1992. They are buried in the Hebrew Cemetery at Maplewood in Durham. 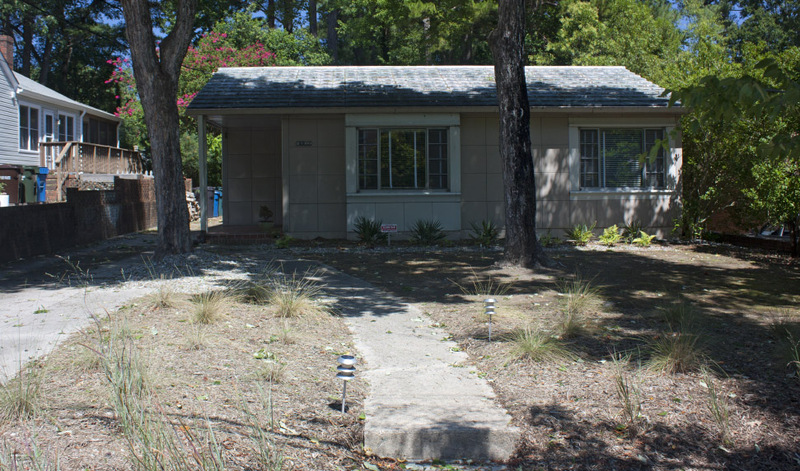 Seventy years of successive owners have recognized that the little Ranch house at 2112 West Club Boulevard was built to be a modern showplace – a model of its style. They have loved and cared for the house as they found it and passed it on unchanged. A previous version of this page referred to information collected in the Watts-Hillandale National Register Historic District application to name this house after Mrs. Iolene Roush, based on her listing in the 1950 city directory. Mrs. Roush was indeed the owner of the house between the Fords and the Swartz family, from about 1949 to 1954. She is listed as proprietor of a Textile Store at 105 N Mangum - in the row of shops that once stood on the west side of Mangum between Main and Parrish. The lovely Colonial Revival house at the center of the Hillandale Commons development was not, despite its surroundings, ever intended to be a suburban house. It was instead designed and built to be the country “honeymoon cottage” of the Drs. Herbert and Frances Fox, who married in Durham in 1937. Frances Faison Hill Fox was already a graduate of both Duke University and the medical school at the University of Pennsylvania when she married Herbert Junius Fox, also a physician. Dr. Frances Fox served on the faculty at the medical school at the University of North Carolina from 1939 to 1941. Dr. Herbert Fox worked at Duke Hospital. Their house is said to have been a gift from Frances’ father, Durham banker, and philanthropist, John Sprunt Hill. The house was designed in 1938 by local architect Archie Royal Davis. 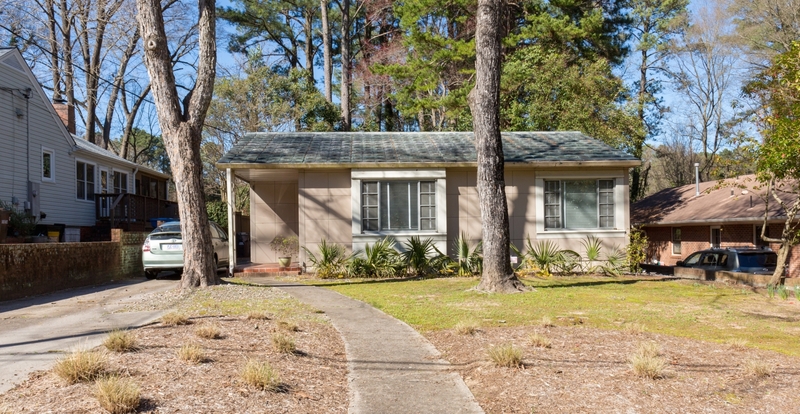 Completed in 1940, the house stood in the shade of acres of pine forest along the north edge of Hillandale Golf Course. Carved from Mr. Hill’s large real estate holdings, the course was originally laid out by Donald Ross in the early part of the century. With Hill’s support it was expanded and became associated with Durham’s first country club on Club Boulevard. The course was the perfect setting for the Foxes’ new home and the house was oriented to look out over its manicured fairways. Archie Royal Davis studied architecture at North Carolina State College and trained with architect Arthur C. Nash. Nash moved from New York to Chapel Hill in 1922 to work at UNC and designed Georgian Revival-style buildings for the school. Davis absorbed lessons in the style from Nash and was also influenced by the massive restoration and reconstruction of Colonial Williamsburg funded by John D. Rockefeller, Jr. The project received a great deal of press attention during the Depression years and sparked a new wave of interest in Colonial America. In the 1940s, in fact, Davis and the Chapel Hill Town Planning Commission encouraged business owners on Franklin Street to remodel in the Williamsburg style. The appetite for Williamsburg Colonials was great in Chapel Hill and Durham and Davis was in constant demand. The house at 1410 Gregson, also on today’s tour, is another Davis design. Davis was a favorite of the Hill family. He designed Quail Roost in northern Durham County as a Williamsburg style country retreat for Frances Fox’s brother, George Watts Hill. For the Foxes, Davis delivered a commodious cottage, with two bedrooms in the dormered attic story and a gracious arrangement of living room and dining room flanking a center stair hall. A large butler’s pantry leads to an even larger kitchen; perhaps these honeymooners entertained often. A paneled den with Georgian fireplace mantel balances the kitchen wing on the other side; both have three-sided bay windows. The roomy garage immediately east of the house has a butler’s apartment in its attic story. The Williamsburg style was never perfectly accurate historically. In Davis’s hands it was a merger of rich details from the past and comfortable modern living. Davis’s version for the Foxes employs historical details like flush-board sheathing under the porch and beaded weatherboards elsewhere. Doors and shutters have raised panels, as was typical of the Georgian style. 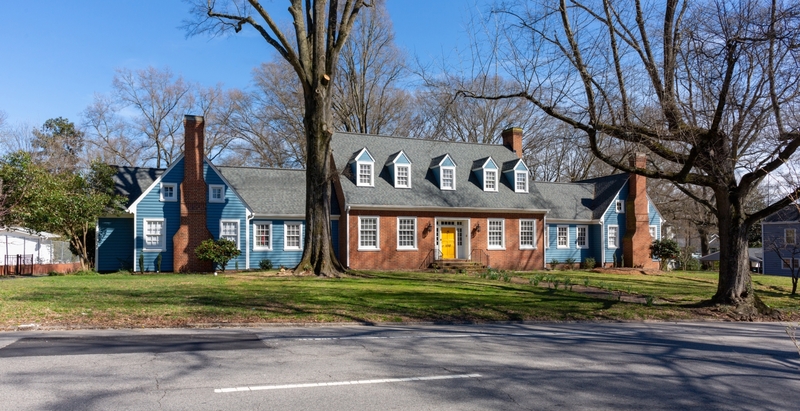 The balanced façade with smaller flanking wings and gable-end chimneys are common elements of Davis’s Colonial Revival-style dwellings. The vertical paneling in the den, on the other hand, is characteristic of the 1940s. The Foxes, it is said, never meant to stay long in this house, despite its charms. Their permanent house was being built north of today’s I-85, on Rose of Sharon Road at the Croasdaile dairy farm that they managed in addition to their medical careers. Still, they lived in their starter home long enough to add two bedrooms and a bathroom at the west end of the house, in a wing that balanced the garage to the east. The added bathroom has hand painted delftware tiles over the sink that look as though they were meant for children. The Foxes sold their honeymoon cottage and eighteen surrounding acres to Dr. Daniel Toms Carr and his wife Annie Hogan Carr. Dr. Carr was from Duplin County and came to Durham after completing his orthodonture training. The Carrs moved from Englewood Avenue to the Fox’ house in 1950 and remained there for the next four decades. Their daughter Frances Carr Dickerson, had her wedding reception at the house and in the pine-dotted yard surrounding it soon after her parents bought the house. She and her husband built the plan-book brick Ranch that stands just east, at the end of the cul-de-sac created with the Hillandale Commons development. 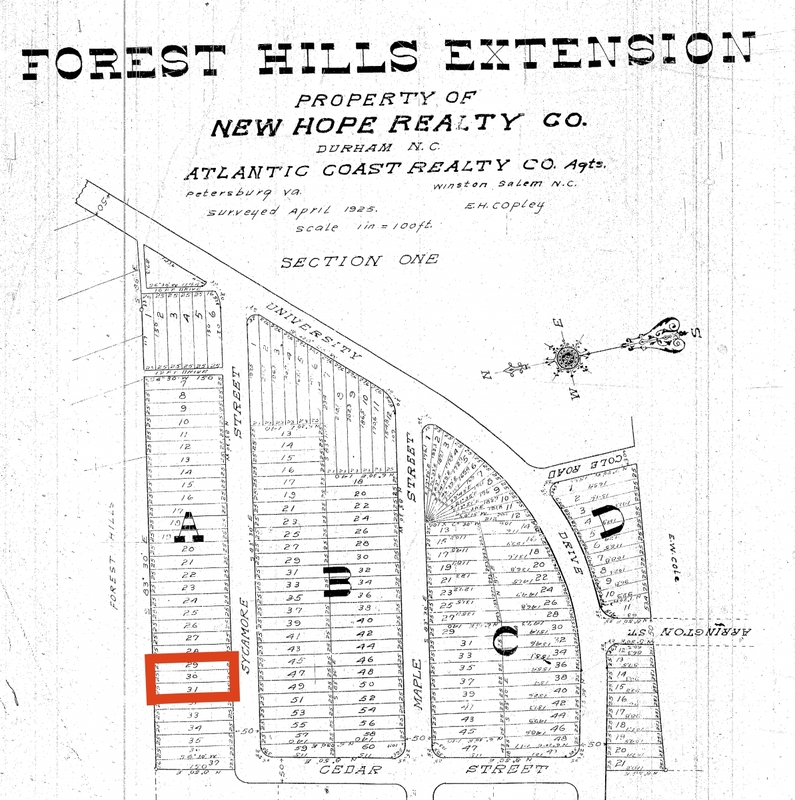 March 2000, Plat for Hillandale Commons development showing the incorporation of the Frances Hill Fox House - just below the circle - and the Dickerson home to the southeast into the new street plan (County Register of Deeds). Frances, her husband William Dickerson, and their children sold the eighteen acres to Robert and Gloria Haywood in 1997. The Haywoods realized upon entering the Fox house that it needed to stay in their new development. They rehabilitated the house and sold it to Dr. Kerri Robertson, an anesthesiologist. She had admired the exterior of the house before it was for sale but really fell for the interior. Her attention to detail in caring for the house extended to having bathroom tile custom made in New York to match the original when repairs were needed. Unsurprisingly, the house won a Pyne Preservation Award in 2001. Even in its new suburban setting the beauty of the Fox house is undiminished. It still inspires owners to care for and preserve it. It still wows visitors. For at least nine Durham families, the unassuming home at 1412 Dollar Avenue has been the stage for their realization of the American Dream. A young florist, a rising bank employee, an entrepreneurial service station worker, a war hero – all among those for whom this property was not simply a place to lay their heads at night, but a key investment in their financial well-being and that of their families. The land upon which the house now sits was once part of the 80-acre farm of Hampton Dollar, whose father and uncles had fought in the American Revolution. Dollar’s land passed to his daughter Demerius and then to her nephew C.L. “Monk” Markham. 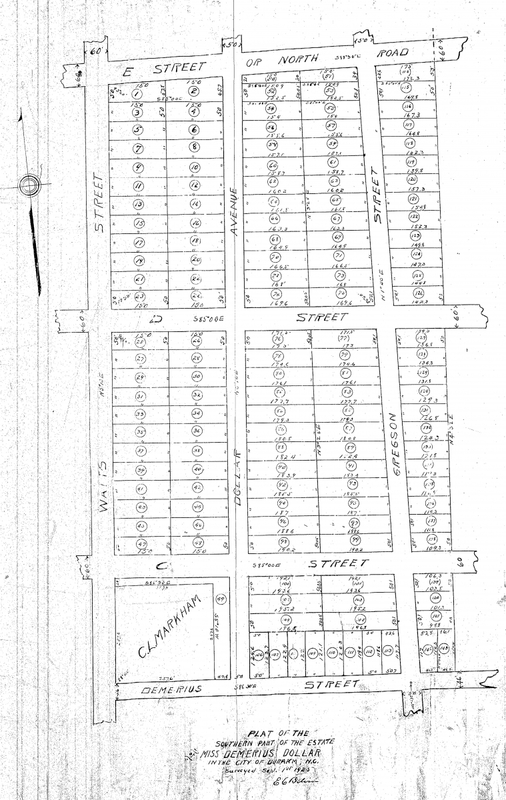 In 1926 The Dollar and adjacent Markham lands were subdivided into 143 lots and platted as “the Southern Part of the Estate of Miss Demerius Dollar.” The development included parcels along Watts, Dollar, and Gregson, between Demerius on the south and E. Street or North Road, now Club Boulevard. 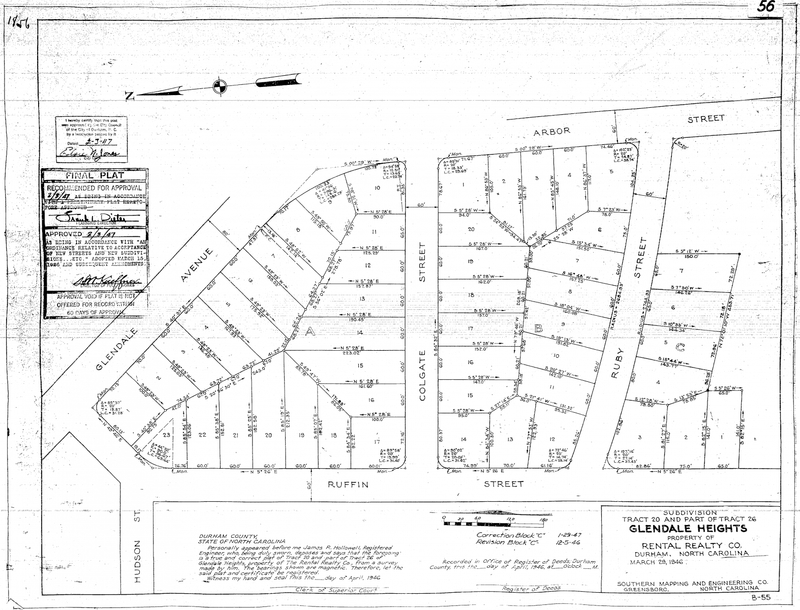 Throughout the 1920s and 1930s, people bought and traded lots in the subdivision and here and there houses were built. This was still pretty far out of town at the time and during the Great Depression, very few houses were built. Many parcels remained vacant, especially those to the north. 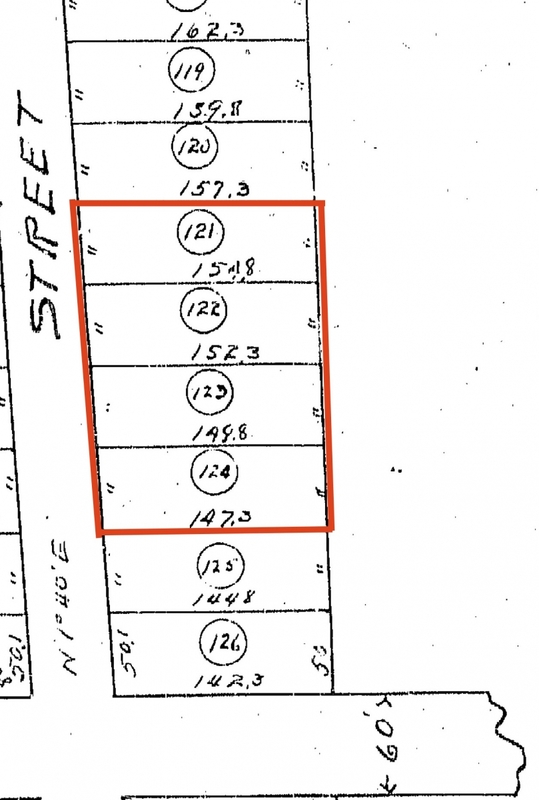 Lot 62, a mid-block parcel on the east side of Dollar Avenue, changed hands several times during this period. First the lot went to the Security Finance Corporation of Durham, then to local orthodontist and speculative developer Dr. Daniel Carr, and eventually to the Cary Lumber Company which most likely built the home which now occupies the property. In August of 1938, Claiborne Montgomery purchased the new home. Montgomery, twenty eight years old at the time, worked at the flower shop owned by his parents on Corcoran Street, now the location of the Jack Tar Motel. The following month Montgomery married Francis Stephens, a secretary with the City of Durham, and they became the first residents of 1412 Dollar Avenue. All of the architectural principles espoused by the FHA are evident in the house at 1412 Dollar. It employs an efficient rectangular floorplan with a simple gable roof and two dormers. This very traditional form was made more interesting by orienting the roofline perpendicular to the street, adding a covered entry with corner columns to the front elevation and a small bump out to the north side. There is nothing fussy about the design. The house is well-appointed given its construction during the end of the Great Depression. The house retains many original features including its large double-hung wood windows, oak flooring, wall paneling, and door and window hardware throughout. The light fixture in the front hall is original, as is the phone cubby in the back hallway and several of the plumbing fixtures. A previous owner removed the wall between the living room and dining room, its ghosted outline visible in the neatly patched oak floor. A 1960s era family room addition to the rear of the house includes a massive brick fireplace. The attic is an unexpected treat with its unpainted tongue and groove siding, heart pine floors, and a powder room with its original sink. This space may have been finished when the house was first built, but in all likelihood, it was created early in the history of the house as the family grew. That growth was anticipated by the architect because the fixed stair is part of the original design. 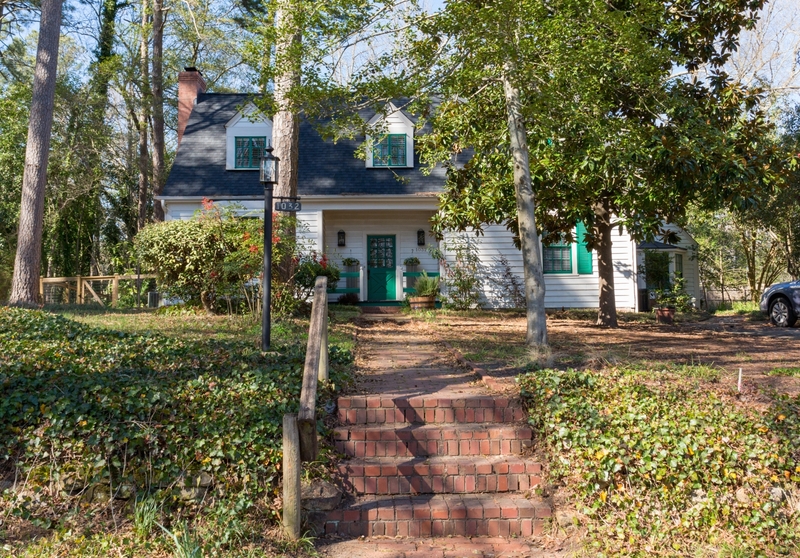 Mr. and Mrs. Montgomery sold the house in 1944 to S.C. Ray and his wife Mozelle Byrd Ray. The Rays were upgrading from their first home at the South end of Duke Street, near the present site of Compare Foods. Samuel had worked at his father’s service station near the Venable Tobacco Warehouse on Pettigrew Street, and had purchased the Nu-Tread Tire Company in 1943. From 1954 to 1957, 1412 Dollar was home to Julian Carr Saunders, Jr., his wife and daughter, both named Annie. Saunders had attended Durham High School and worked as an actor at the Center Theatre before joining the army in 1942. He worked as a cashier at the Fidelity Bank, but as his fortunes improved the family moved to a large ranch home in leafy Hope Valley. Perhaps the most interesting and heartbreaking story of those who called 1412 Dollar home, is that of the Malloys. James Malloy was born in Missouri. At the age of eighteen, he enlisted in the U.S. Navy. He reported for duty aboard the cruiser U.S.S. San Francisco in Pearl Harbor Hawaii on August 7, 1941. Malloy survived not only the attack on Pearl Harbor four months later, but four long years of war including the battle of Guadalcanal, which saw both the ship’s Captain and Admiral killed in action. After the war’s end, Malloy met and married Fannie Webb Daniel, who had served as a member of the Cadet Nursing Corps at Park View Hospital in Rocky Mount. The Malloys moved to Durham, where he first worked as an auto body repair man before taking a new job as Shop Foreman at Miller Truck Sales on Hillsborough Road. In 1956 James and Fannie were able to purchase their dream home on Dollar Avenue. Just four years later, James died suddenly of a heart attack at the age of 38 “en route to Watts Hospital.” Fannie remained in the home until 1977, and passed away in 2014 at the age of ninety-five. 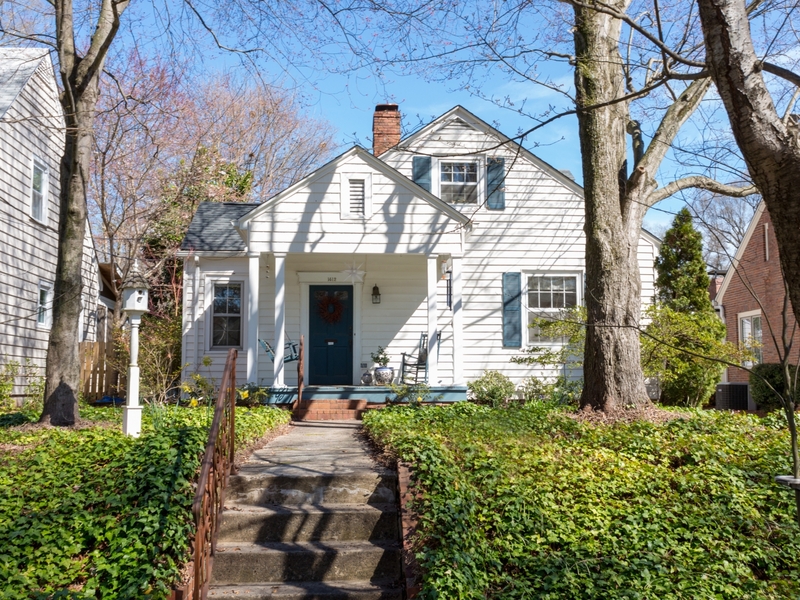 The house at 1412 Dollar Avenue has been the gateway for homeownership for several young Durham families and lately a haven in retirement for others. That it has remained so little changed for more than eighty years is a testament to the durability and livability of its Minimal Traditional design. During the years of the Great Depression, new home construction stopped. The only thing happening to capture national attention and shape popular architectural taste was the work at Colonial Williamsburg. Articles about the restoration of Williamsburg and Colonial Revival homes filled influential magazines like the Ladies Home Journal and House Beautiful. Proportions conceived by ancient Greeks, and forms and details of early Federal and Georgian structures were taught to architectural students across the nation, among them 1934 North Carolina State College graduate Archie Royal Davis. After a few years of apprentice work with other architects, Davis started his own firm in Durham in 1939. 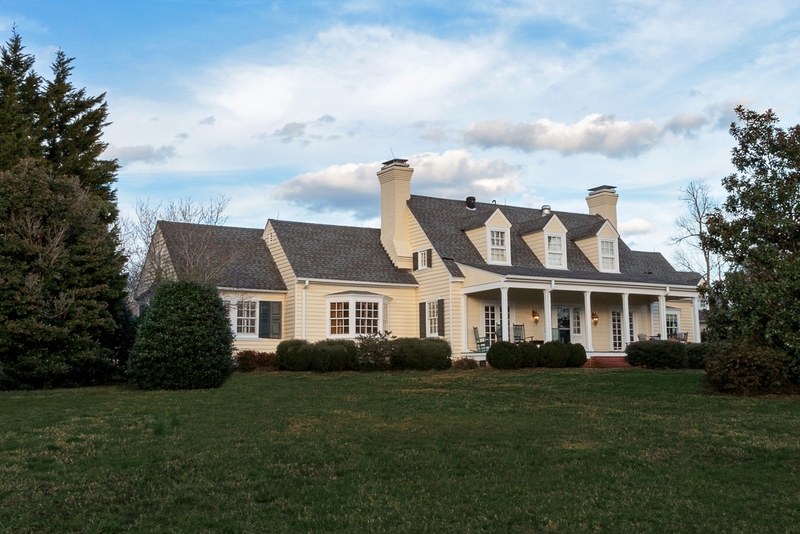 He proved to be a master of the Williamsburg Colonial Revival style and developed strong relationships with well-to-do patrons in Durham and Chapel Hill. He designed a number of Williamsburg style houses for members of the wealthy Hill family, including the Frances Hill Fox house on today’s tour. In January of 1948, Davis drew up the plans for a new Williamsburg home for Durham builder and insurance salesman Jefferson Davis Gibson, Jr., and his wife Drusilla. The Gibsons owned a large parcel at the northern edge of Trinity Park. Davis’s design took full advantage of the lot’s width. The Gibsons' possession of four consecutive plots on the east side of Gregson made Davis' design possible. These lots are from the same subdivision map as the other houses on this tour at 1412 and 1418 Dollar Avenue (County Register of Deeds). The house is composed of five units arranged with perfect symmetry. This organization of a house connected to matching dependencies was developed by Renaissance architect Andrea Palladio and is seen in the villas he designed in country side around Venice. Palladio’s designs impressed eighteenth century English architects and their patrons who copied them in their Georgian country houses. Palladio’s influence was imported to America with Georgian architecture and translated into Colonial Revival homes in the twentieth century. The main body of the Gibson house is connected to matching dependencies by one story “hyphens.” The one-and-a-half story, side-gabled central mass of the house is organized in five bays and clad in brick. The bricks are laid in a Flemish bond pattern with mortar joints raked in a decorative pattern. The dependencies are covered with wood clapboards with a beaded edge. Each dependency has a massive brick chimney in its front-facing gable end. The heavy, paneled front door in the center of the house is original and it retains its colonial brass hardware. Note the small brass knob and box lock. The door is set in a recess and surrounded by sidelights and transom. The windows in the main block have wide muntins and are organized in a six-over-twelve pattern. Elsewhere, the windows are organized in a six-over-six pattern. Nearly all of the windows in the house are original. The cornice of the building is decorated with dentil molding. The attic is lit by five matching gabled dormers. Front Elevation drawing, January 1948. Archie Royal Davis Papers, NCSU Libraries, Special Collections Research Center. Davis’s special skill was his ability to work historical details into comfortable modern living spaces all in a Colonial Revival package. In the Gibson house, the front door opens into a spacious hall the central feature of which is an elegant curved stair. The hall passes beneath the stair through the house to a door opening to the large back yard. To the left of the hall are a formal dining room and beautifully paneled library. To the right are a gracious, full-depth living room with fireplace and original Georgian style surround. Note the rich casework and brass hardware. The left dependency of the house and its hyphen encompass a small butler’s pantry and “maid’s toilet”, the renovated kitchen (now expanded into a former sun porch), laundry, and two-car garage accessed from the home’s rear. A back stair serves the maid’s quarters above the garage. The right or south dependency and hyphen contain the sleeping quarters - three large bedrooms and two full baths. There are two more bedrooms upstairs. J.D. Gibson hardly had time to enjoy is lovely new home. He died in 1950. Drusilla Gibson lived on in the home until 1977, when she sold it to Donald and Kirmeth Wright. 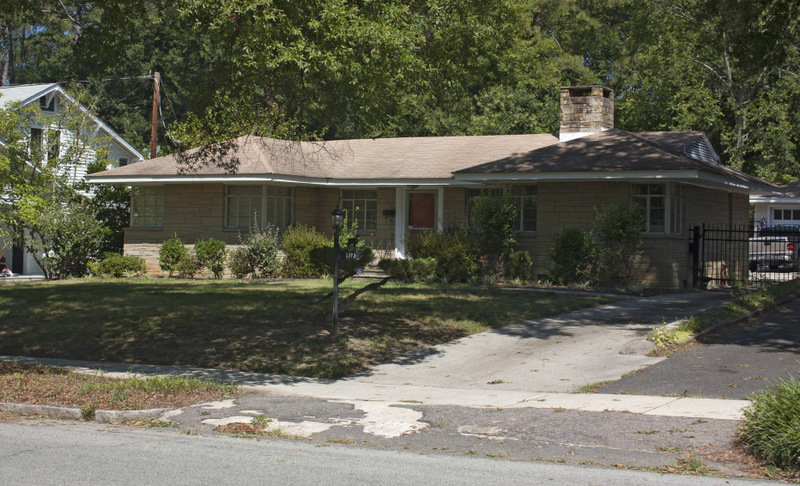 Mr. Wright owned the home until 2009, selling it shortly before his death to Mark Sprouse. Under Sprouse’s stewardship, the Gibson home underwent a multi-year restoration. In 2013, Mr. Sprouse sold the house to the current owners. The house remains almost entirely intact, retaining its original wood double-hung windows, quarter sawn oak floors, ornate interior trim and moldings, built-in casework, and hardware. Except for an enlarged and updated kitchen, the home remains true to Davis’s 1948 drawings. Although Davis would go on to design many buildings of a more modern bent, among them round houses on South Duke Street, Durham’s courthouse annex, and the Jack Tar Motel, the Gibson house demonstrates his mastery of traditional architecture as well as the power of historic preservation to connect us with our unique American past. Several significant but discreet changes have been made to the exterior of the house since its original construction. The right recessed wing, connected to the house through a breezeway, was formerly a garage. The most significant change occurred in 1953 when the Skinners enlarged the living room the rear and added new living space above. These changes are nearly seamless. Only a slight bump in the ridge line in the roof and small differences in the left-hand dormer give the addition away. The bill for the work was nearly ,000. In 1967, the Skinners enclosed the rear porch. It is now part of the kitchen. The home has several types of windows: steel casement windows in the upper dormer windows and wood six-over-six sash windows throughout much of the rest house, and a pronounced bay window in the living room.